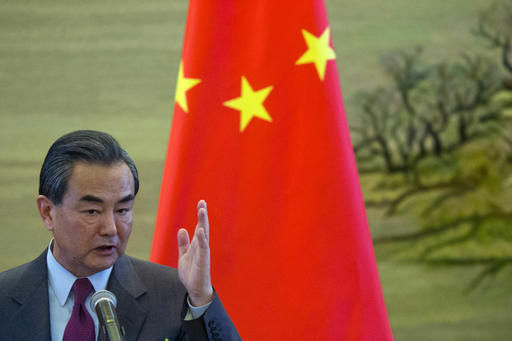 PHNOM PENH, Cambodia (AP) — China's top diplomat praised Cambodia for its support of Beijing's positions on world affairs as he ended a visit to one of the country's closest allies in Southeast Asia on Friday. China is at odds with several of Cambodia's fellow members of the Association of Southeast Asian Nations who accuse Beijing of illegitimately extending territorial claims in the South China Sea. Chinese Foreign Minister Wang Yi and Cambodian counterpart Prak Sokhon said at a news conference that Cambodia backs Beijing's call for a solution that does not involve interference from outside — an unstated reference to U.S. naval support for some of the countries challenging Beijing's claims. Wang Yi said China's buildup of infrastructure on islands in the contested waters does not affect the interests of other countries or interfere with the navigation of ships traversing the area. Wang Yi reaffirmed that China will assist Cambodia in education, tourism, health care and clearing land mines, which are a legacy of decades of war in Cambodia that ended in the 1990s. Wang Yi also met with Cambodian King Nordom Sihamoni and Prime Minister Hun Sen during his two-day visit. China's influence in Cambodia is considerable despite Beijing's strong backing of the former communist Khmer Rouge government that was responsible for the deaths of some 1.7 million people in the late 1970s.